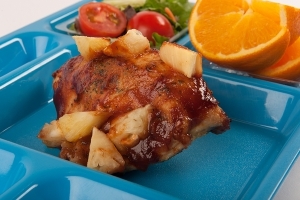 Place chicken in large bowl and pour barbeque sauce over chicken. Toss chicken to cover pieces with sauce. 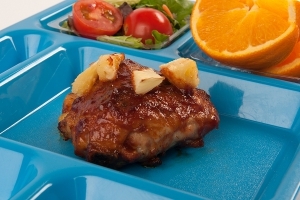 Arrange chicken in a single layer on parchment paper lined sheet pans (18" x 26" x 1"). Top with 1 ounce of pineapple. Conventional Oven: 425 degrees F, 50 minutes. Convection Oven: 350 degrees F, 45 minutes. Transfer to steamtable pans (12" x 20" x 2½") for serving. If the chicken will be stored until time for service, cover with aluminum foil and cut holes in aluminum foil. Place the steamtable pans in warmer until ready for service. 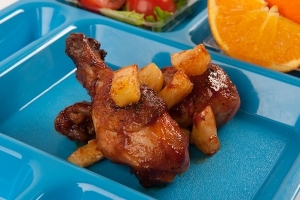 Portion 1 breast, or 1 drumstick and 1 wing, or 1 thigh, or 2 drumsticks, or 3 wings for serving. Each portion provides of 2 1/2 oz. eq. meat/meat alternate. If using purchased products, refer to the USDA FNS Food Buying Guide for School Meal Programs, or check for CN labels for correct yield information. Ounce equivalence information is based on data from the USDA FNS Food Buying Guide for School Meal Programs.